When John Reis' name is attached to a project, you are guaranteed my money immediately. Over the past 20 years I cannot think of anyone who has consistently provided me with so much amazing music. Even now he still surprises me. When I heard he was putting out an album of surf music with Minnesota powerhouse The Blind Shake, I figured that I would like it. I enjoy everything both have done. But even I was unprepared by what an incredible, absolutely immersive experience this record is. I've read several interviews with John where he states that although the history and lore of surf music was his starting point, he major inspiration for this album was the sea. You can really hear that throughout the course of the album. From the chaotic choppy turbulence of opener "Sea Saw" to the laid back, but still somewhat ominous "Brown Room" to the stormy "Zulu As Kono" the many moods of the ocean are interpreted though these songs. 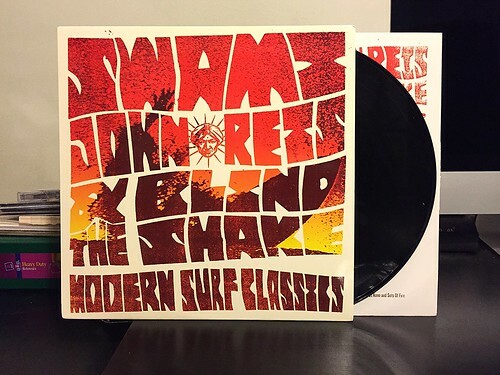 Modern Surf Classics is not a paint by numbers surf copycat album, it's a sprawling instrumental that pulls equally from a variety of styles and influences. The odds of me writing a bad review of a John Reis band are pretty slim, his music just speaks to me. But this isn't just lip service, Modern Surf Classics is truly a fantastic record and an essential pick up. They are playing a handful of shows in February and when they come to New York City, I will be there. I don't go to many shows anymore, so if these guys are getting me out of the house, rest assured it's an album you should be buying.